It’s important to brush your teeth twice a day because brushing removes plaque that can damage your smile. Plaque is the filmy substance that forms on your teeth after you eat something. If the plaque isn’t removed promptly, it can harden and become tartar, the rough substance that your dental hygienist scrapes off your teeth when you get them cleaned. You need to get rid of the plaque and tartar on your teeth because otherwise it can lead to cavities and gum disease, which are both serious threats to your smile. Of course, you also need to remove the plaque from places your toothbrush can’t reach. 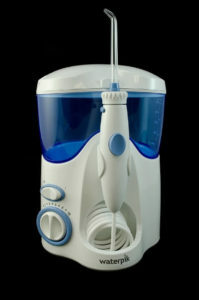 Dental irrigators have been an option for people who don’t like flossing since the Waterpik was introduced in 1966. There are now several other models available. Sometimes it gets a little bit confusing because dental irrigators are often referred to as dental water jets or water flossers. But whatever you want to call them, many people report that they find dental irrigators to be more gentle than flossing. Many people who suffer from gum disease don’t like to floss because it can cause pain and bleeding. Unfortunately, failure to clean the interdental regions will probably exacerbate gum disease. Dental irrigators can be an effective choice for people with gum disease because they are “up to 93% better at reducing bleeding” when compared to flossing. Whichever type of interdental cleaner you select, it’s important to visit your dentist at least twice a year to prevent cavities and gum disease. Give us a call at Family Implant and Restorative Dentistry to schedule your next appointment today.